Dancehall artistes Chronixx and Govana showed that they are serious about supporting the youths after recently hosting a back to school treat dubbed “Free Paper Bun Funday” for the children in Spanish Town. The treat, which was organized by Chronixx’s C.H.O.R Foundation in collaboration with Chronixx Music Group, took place last Sunday at the Prison Oval complex in Spanish Town, St Catherine. Children were treated to a series of giveaways at the inclusive event, which also provided them with snacks, refreshments, access to games, rides as well as musical entertainment throughout the day. The “Skanking Sweet” singer was also joined by 4th Genna artist Govana, who came out and gave personal assistance in the issuing of packages to kids while also making a $100,000 donation towards Chronixx’s Foundation. Govana, who is also a native of Spanish Town, has always been a strong advocate for youth development and education says he was more than happy to lend his support to the cause after learning about the treat. 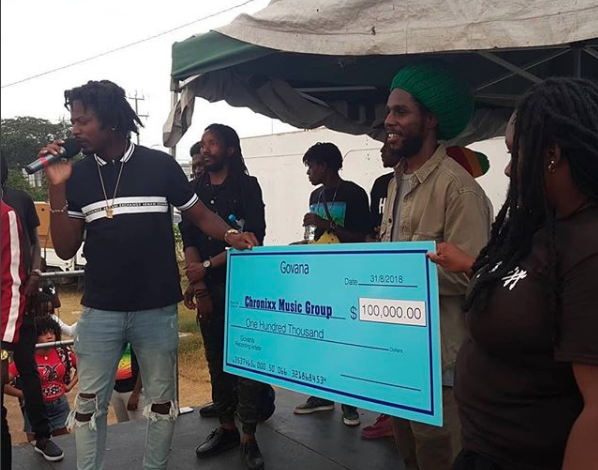 Chronixx joins the long list of entertainers to recently gave back to their communities as Dancehall superstar Popcaan recently staged his “Off To School” funday and treat in Morant Bay, St Thomas.